Mine is helping students meet their goals. I love encouraging them and giving them the support they need to reach their goals no matter what they are. I have helped students reach many academic, behavioral and personal goals, and have had the pleasure of experiencing the excitement and pride of accomplishment with them. I wanted to bring this opportunity to all of my students, and I want to help bring it to the students in your classroom as well. That is the goal of my website. 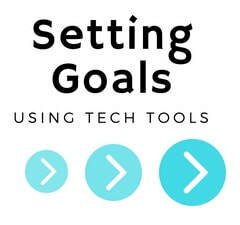 How can technology be used to implement goal setting procedures with elementary school students? ​The reason I chose this question is because I wanted to equip students with the goal setting skills they will need in order to become motivated, and successful lifelong learners. Do you ever feel like you're the one doing all the work? ​In the past, I felt like it was my job to keep track of all of my student’s scores. This lead to students taking little responsibility for their learning. ​I wanted to be able to help my students to take ownership of their learning, and I have found some reliable tools and strategies for goal setting that can be implemented in any classroom.